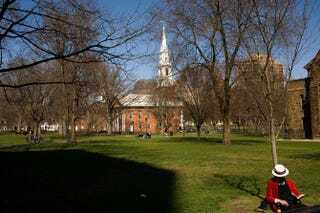 A man reads on the green at Yale University April 16, 2008, in New Haven, Conn.
A black Yale University student took to social media Saturday to say that she wasn't allowed into a fraternity party because it was a "white girls only" affair. "I'd just like to take a moment to give a shoutout to the member of Yale's Sigma Alpha Epsilon chapter who turned away a group of girls from their party last night, explaining that admittance was on a 'White Girls Only' basis," student Neema Githere posted to her Facebook page, the New York Post reports. "And a belated shoutout to the SAE member who turned me and my friends away for the same reason last year," the post continued. "God Bless the USA." According to the newspaper, several students posted claims on Facebook backing up the sophomore's charge. "They turned away my group made up of all minorities last night," wrote student Kristen Wright. Columbia freshman Sofia Petros-Gouin was visiting friends at Yale when she said she witnessed a male student manning the door for the party at SAE's off-campus house, telling people that they were looking for white girls only. "A group of girls came up who were predominantly black and Hispanic," Petros-Gouin told the Washington Post. "He held his hand up to their faces and said, 'No, we're only looking for white girls.' … He pulled a blond girl up from the bottom of the stairs—over some people—pushed her inside and said, 'We are looking for white girls only, white girls only.' No brothers corrected him or said anything." Yale SAE chapter President Grant Mueller denies the accusations made against the fraternity. "Obviously, I was shocked and flabbergasted [at the idea] that anyone in SAE would even have these words come from their mouths," Mueller told the Yale Daily News Monday. Muller and several SAE members held a forum at the Afro-American Cultural Center Monday to talk about inclusiveness on campus and the allegations made against the fraternity, according to the Washington Post. "It's just kind of upsetting for me because we try to be so incredibly accepting and take pride in our diversity," Muller told the Yale Daily News. In March the University of Oklahoma chapter of SAE was closed after video surfaced showing members of the fraternity singing a racist chant.